(Nanowerk News) Nanoparticles of various types can be quickly and permanently bonded to a solid substrate, if one of the most effective methods of synthesis, click chemistry, is used for this purpose. The novel method has been presented by a team of researchers from the Institute of Physical Chemistry of the Polish Academy of Sciences, Warsaw, Poland. A small movement of the hand, the characteristic 'click!' - and the snap fastener quickly and securely fastens our clothes. One of the newest methods of synthesis in modern chemistry, click chemistry, works on a similar basis. Here, molecules are combined to form new chemical compounds by means of chemical 'snaps'. The method has so far been used mainly for the synthesis of more complex organic compounds. Now at the Institute of Physical Chemistry of the Polish Academy of Sciences (IPC PAS) in Warsaw, Poland, they have managed to show that click chemistry chemical snaps can quickly, effectively and permanently bond much larger structures: gold nanoparticles to a glassy carbon substrate (Electrochemistry Communications, "Electroassisted click chemistry immobilisation of gold nanoparticles on a solid substrate"). The main idea of click chemistry was formulated in the final years of the previous century. It was inspired by nature, among others by the large number of proteins that arise from the diverse combination of amino acids with the same bond (peptide). Chemistry according to the click method has a lot of advantages. Many reactions take place at low temperatures, in addition in a single solvent, which can often be environmentally friendly water. What's more, the yield of the reaction is high: usually approx. 80-90%. The versatility, efficiency and selectivity of click chemistry has made it very popular, especially in the synthesis of new organic compounds. "Click chemistry is similar to building new structures with building blocks. The blocks can be various chemical compounds, what is important is for them to have matching snaps. A problem arises when they are not present. Then you have to consider whether you can somehow attach the right snaps to a given building block," says Dr. Joanna Niedziólka-Jönsson (IPC PAS). The Warsaw-based chemists decided to apply click chemistry not to chemicals, as was previously the norm, but to bond nanoparticles - i.e. relatively large objects - to solid substrates. "Usually, nanoparticles are simply deposited on the substrate and they attach to it by quite weak physical, for example electrostatic, interactions. 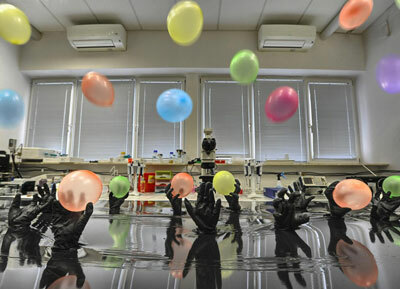 We decided to show that with click chemistry they can be bonded to the substrate with covalent chemical bonds and thus permanently," stresses Dr. Adam Le?niewski (IPC PAS), winner of the Iuventus Plus grant from the Polish Ministry of Science and Higher Education, under which the study was carried out. To form the bond, the researchers from the Institute of Physical Chemistry of the PAS used well-known chemical 'snap fasteners': groups of three nitrogen atoms (azides), which in the presence of a catalyst can combine with groups of carbon atoms (terminal alkynes) located at the end of other molecules. When they are connected, the two groups form stable nitrogen-carbon (triazole) rings. In this study, the azide groups were located on a glassy carbon substrate, and the terminal alkynes were introduced onto the surface of gold nanoparticles. In earlier studies at the IPS PAS the catalyst participating in the reaction was produced chemically. Currently an electrochemical method is used for its generation, in which the role of the substrate is played by an appropriately prepared carbon electrode. "We have managed to adjust the conditions of the whole process so that the suspension of gold nanoparticles in the solution surrounding the electrode remains stable while maintaining an appropriate concentration of copper two ions and supporting electrolyte. In this environment, the production of the right catalyst, complexes of copper one and the bonding of nanoparticles itself to the substrate is very efficient," explains PhD student Justyna Matyjewicz (IPC PAS). Using a flow of current has significantly shortened the reaction time of the nanoparticles bonding to the substrate. "We have been working with gold nanoparticles and carbon substrates, but our method is universal and in the future it can be used to produce substrates from other materials," emphasises Dr. Niedzió?ka-Jönsson. Substrates produced by the Warsaw chemists are already making it easy to detect, among others, nitrites in the presence of sulphites. Sensors constructed on the basis of such substrates can be used, for example, to detect the presence of preservatives in foodstuffs. In the future, the type of click chemistry proposed by the IPC PAS researchers may find an application in the production of new, stable substrates for a variety of chemical sensors and electrodes employed in flow systems.